Explanation: The Virgo Cluster of Galaxies is the closest cluster of galaxies to our Milky Way Galaxy. The Virgo Cluster is so close that it spans more than 5 degrees on the sky - about 10 times the angle made by a full Moon. 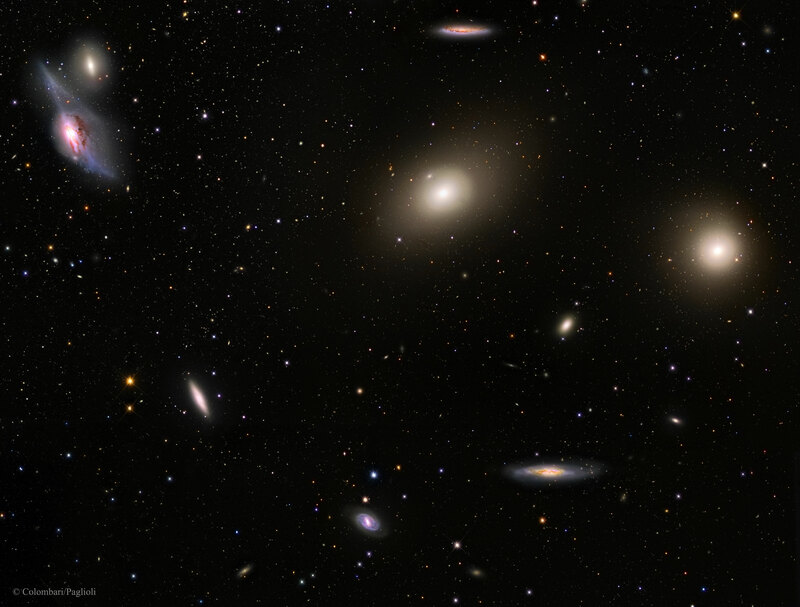 With its heart lying about 70 million light years distant, the Virgo Cluster is the nearest cluster of galaxies, contains over 2,000 galaxies, and has a noticeable gravitational pull on the galaxies of the Local Group of Galaxies surrounding our Milky Way Galaxy. The cluster contains not only galaxies filled with stars but also gas so hot it glows in X-rays. Motions of galaxies in and around clusters indicate that they contain more dark matter than any visible matter we can see. Pictured above, the heart of the Virgo Cluster includes bright Messier galaxies such as Markarian's Eyes on the upper left, M86 just to the upper right of centre, M84 on the far right, as well as spiral galaxy NGC 4388 at the bottom right.